We’ve been following the terrible news of flight MS804 from Paris to Cairo that went into the sea with 66 lives lost. Our thoughts go out to the families. The obvious thought is that it is terrorist related. It appears there was a fire in the toilets and area underneath the cockpit based on telemetry transmissions. Some news sources are also saying that the pilot spoke to Egyptian air traffic control after the said fire happened. The Greek Government is saying that the plane turned 90 degrees then spun around 360 degrees. Today, the Egyptian Government is counter claiming that the pilot talking to traffic control and the spin didn’t happen. Some off the wall tabloid stories are even saying UFO’s were sighted an hour before the crash. It is likely that we will not get the real story soon especially will take some time to retrieve the black box and there are politics involved in controlling the story. 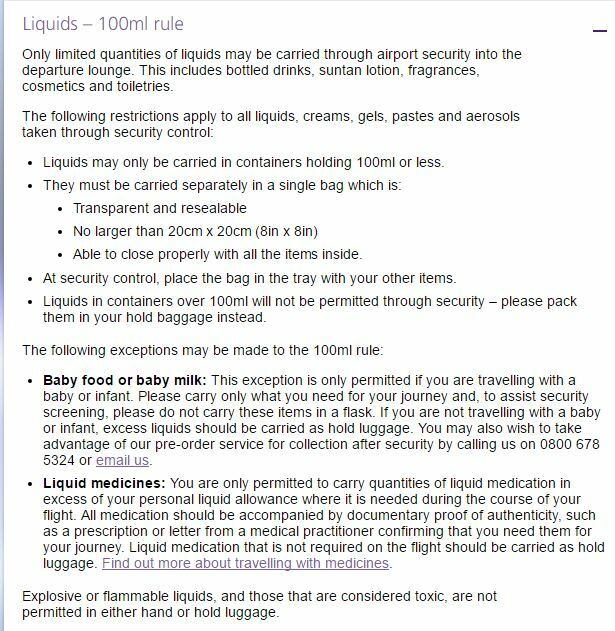 Nevertheless, what we do know is that this is another catastrophe for the Egyptian tourist industry especially at the Sharm-El-Sheikh resorts where rooms at Radisson Blu Resort are going for less than 20 UK pounds per night. The area already impacted the Russian aircraft bombing and then cutting off of flights from UK. We guess this is what the fundamentalists want – They need to destroy the village to save the village – and our thoughts go out to all those in Middle East whose livelihoods depended on tourism. 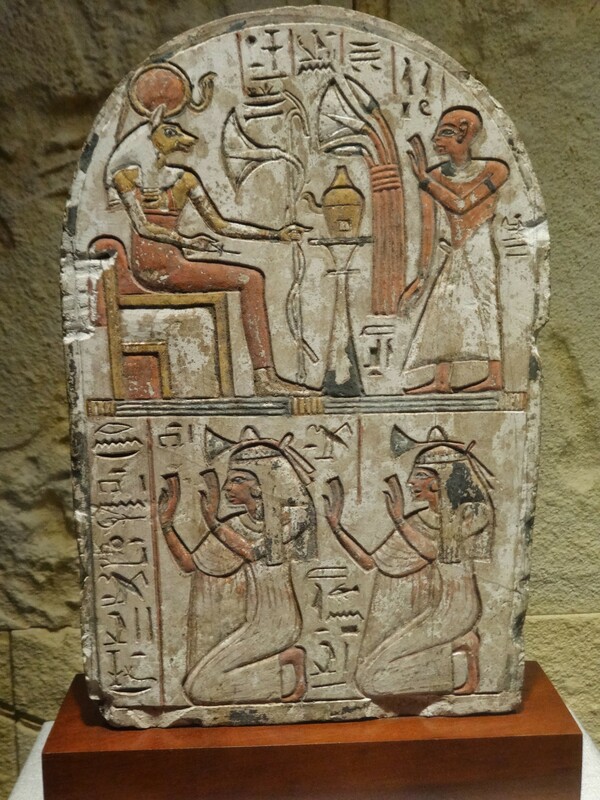 In Cairo, the tourism had already been hit after the Coup D’Etat against Morsi and the Muslim Brotherhood. However, we don’t see this sorry story ending anytime soon. Either in the Middle Eastern tourism industry or in the terrorist attempts by ISIS or their affiliates. It’s spring time and I am craving Asparagus. 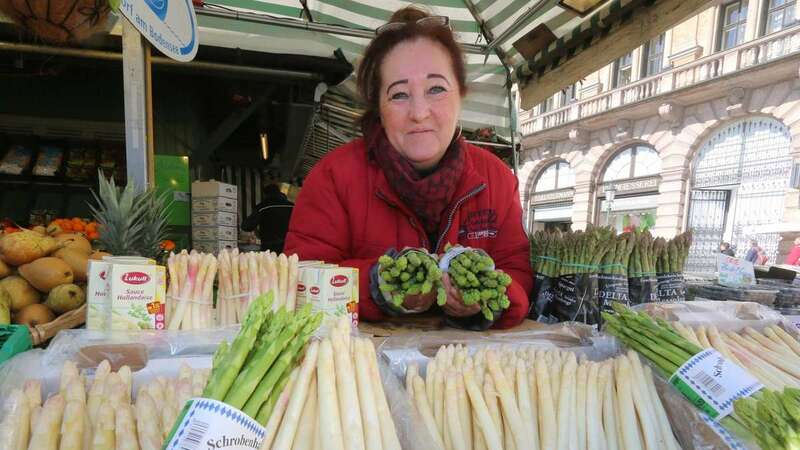 This time of year has me thinking about “Spargel zeit” in Germany where in many restaurants in Germany from Mid-April to June, you will see special items on the menu celebrating fresh Asparagus. Note that the Germans prefer white asparagus over the green asparagus that Americans eat. I remember visiting Augsburg and finding a restuarant that had dedicated “Spargel Fest” menu of nothing but Asparagus items. Multiple soups, appetizers and main courses. I had Spargel mit schinken accompanied with a good Hefeweizen. If you are in Munich, check out the viktualienmarkt to see some traditional food grocers – see the picture. 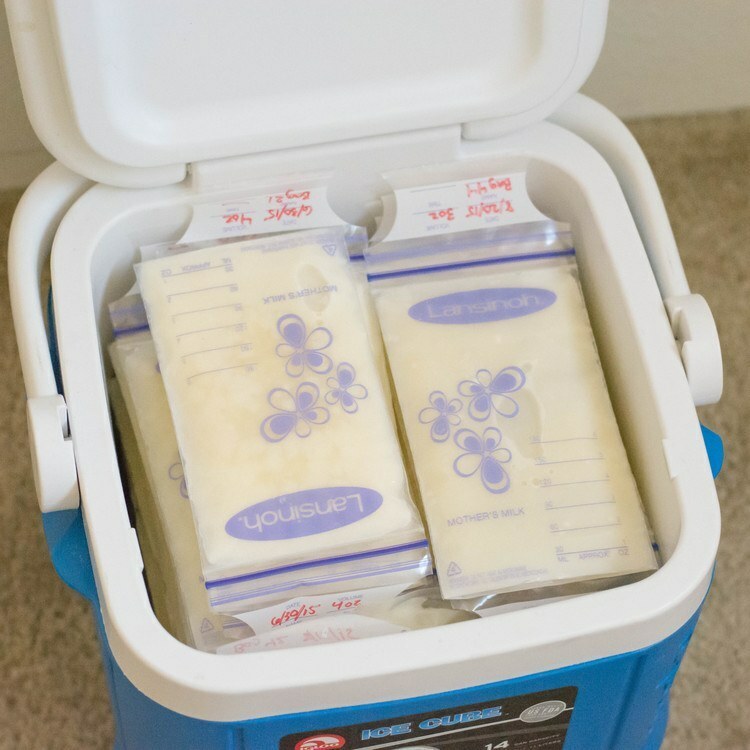 Just look how fresh it looks. Buying fresh asparagus at Munich’s Viktualienmarkt. 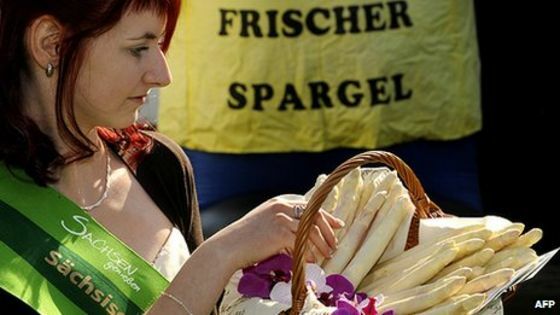 Still hungry for more, here is a discussion by an Austrialan lady on Spargel Fest. It contains a good recipe for Asparagus soup or Spargelcremesuppe as it is known over there. To add our 2 Eurocents on best way to cook ’em : The best way is to blanche it but shave them with a European vegetable peeler first. 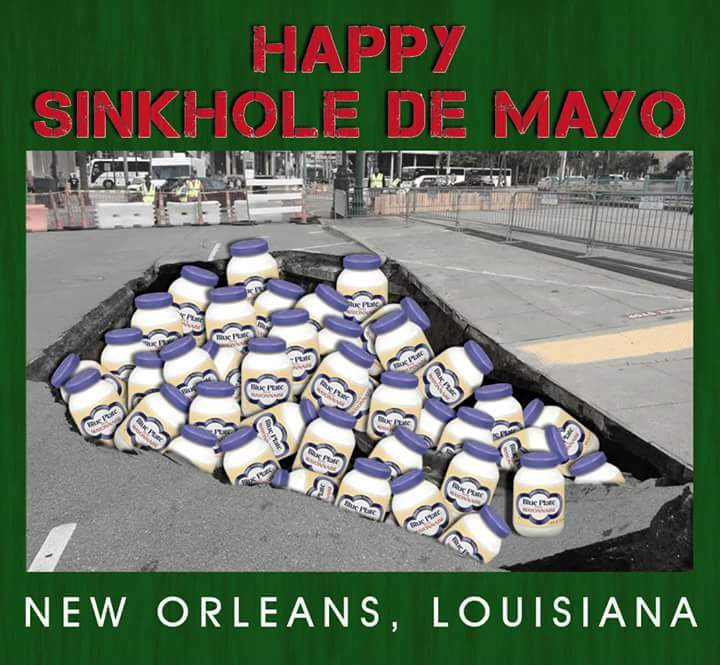 Happy Sinkhole de Mayo ! New Orleans : On April 29th a large sink hole appeared on Canal Street near a tunnel running underneath Hurrah’s Casino. For those not familiar with the place, Canal street is one of the City’s busiest streets. Not good if you ask me. The cost to repair is estimated at $3 and will take 6 months. A day before the Canal Street incident, there was there was a sink hole at Constantinople Street (Why isn’t it Istanbul street you may ask?). To complete the Fleur de merde, on 4th of May there was a recent one at Taft Place. 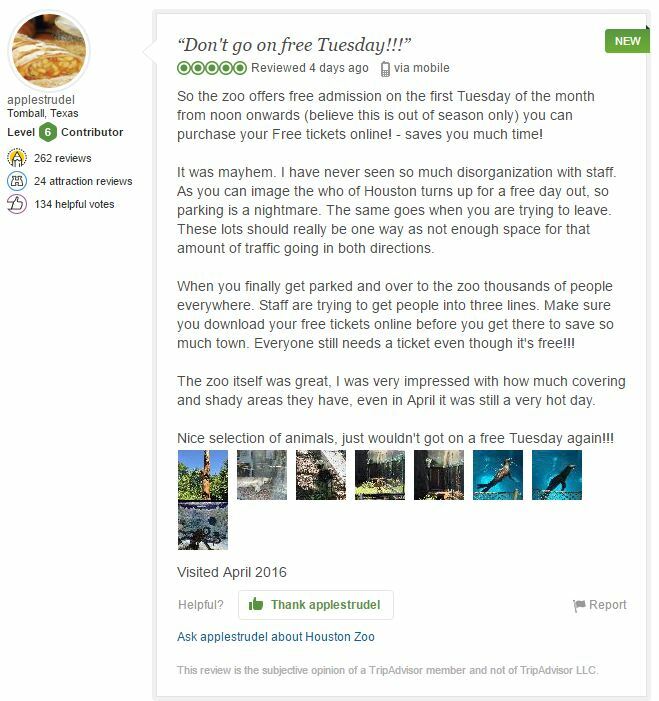 However, that is not why I am posting – After all, sink holes around the US are pretty routine news unless that is it manages to envelope the Mayor and it’s infrastructure team with them – but since New Orleans is a party town, what better way to face up with the City falling apart than to have a party : “Sinkhole de Mayo” – see their facebook page. If number of accepting is correct, 1600 people will attend. The original intent to have it near the Canal Street hole has been scotched due to safety reasons. It will be held at Woldenberg Riverfront Park, in front of the Aquarium of the Americas. Postscript: This is not the only time that Sink Hole has been turned around to be a tourist attraction – see “The money Pit” and the National Corvette Museum. Today greater Houston got drenched with up to 16 inches of rain and we have more to come in the next few days. Roads were submerged causing city wide chaos and many bayous breached their banks. Many cars were lost in the water and unfortunately some people drowned. Houston Metro shut down – no buses, no trains. I was due to fly out to Dallas this morning and since the continuous thunder storms had kept me awake every other hour, I was easily awake before my alarm so I listened to radio to got a feeling of what awaited me: Floods, floods and more floods. A text from Southwest told me my flight was delayed until 10:55 which may just still get me to my intended afternoon meeting – Dallas Love Field is great for getting in and out of the airport. DFW forget it ! As I listened to more radio news, daylight revealed a cop car with it’s lights on my main road out of my place. Since I noticed no traffic whatsoever on an otherwise busy road, it indicated my road was flooded. Killing two birds, I took the dogs out and verified it. Yep, Flooded with even a few stalled out cars. I told my boss I couldn’t come and went online to cancel my ticket only to see my flight already cancelled. I requested the refund and made breakfast. Some time later, I get the auto email notifying me that my flight is cancelled. Yeh, thanks for nothing SWA especially as I could have been traveling to the airport. Around the same time, the radio announced that Houston International had cancelled 300 or so flights (Almost 500 in the end) and roads around both airports were flooded. Thus, even if I had tried to drive to Houston Hobby airport, I would not have not made it. It turned out that SWA had cancelled all their domestic flights from Hobby until 4:00 pm – I’ve lived here 17 years and never seen anything like this before. Normally SWA are super at working with storms ! 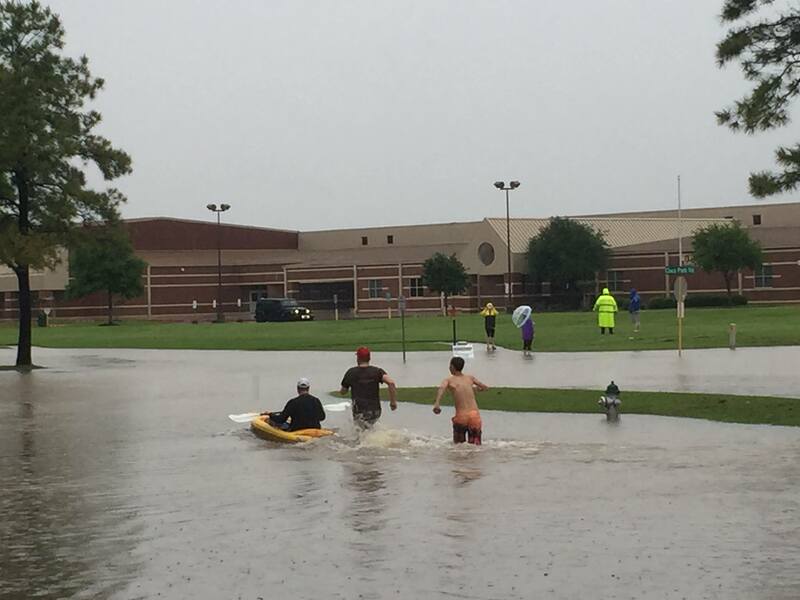 Patricious’ school ISD had cancelled all classes. This I heard from the radio around 6:30 (and getting myself ready to leave for the airport and about to wake him up) , I told him so he could sleep in. As I walked past his room about 15 minutes later I see a light on in his room. Is he watching TV to find out what is going on? Nope, playing Video games. So much for the sleep in. Didn’t even want breakfast. Before lunch, I drag Patricious to walk in the rain with me and look at the all flooding around us. He was excited to see such as an adventure. The picture taken is outside Patricious’ school. Not very often do you see kayaks in the streets. Stockholm syndrome: The most inappropriate selfie? The hijacker was not a Jihadi but some run of the mill fruitcake who apparently had strapped explosives around himself and threatened to detonate it. He chose Cyprus in order to deliver a 4 page letter to his ex-wife who now lives in Cyprus. It all turned out well, if you can call it that, in that the explosives were fake and he is now in custody. 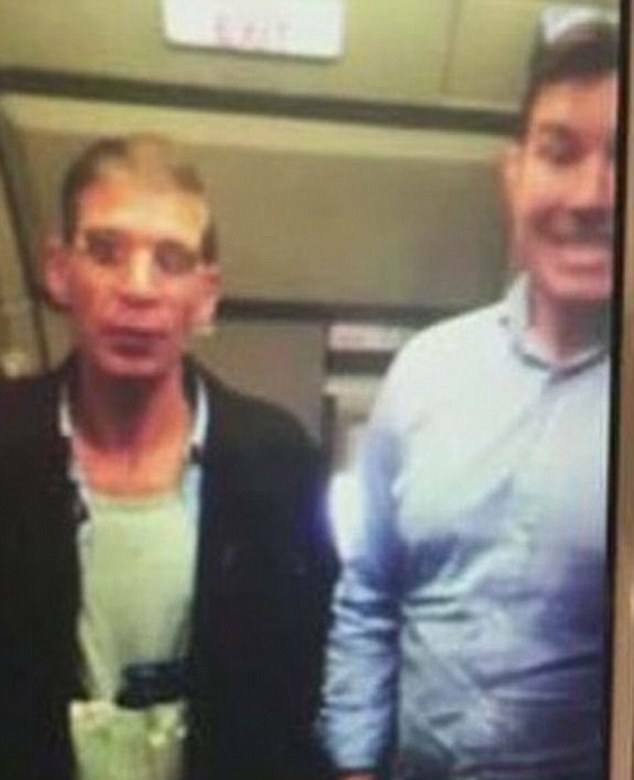 Now what makes this even more strange is the selfie of a a hostage with the hijacker. I don’t think I’d be smiling if there was a suicide bomber next to me unless it turns out he was forced to do so. But seriously, this event makes asks a lot of questions about Egyptian airport security.